The owner of a fire-ravaged mansion near Loch Ness has been left “totally distraught” by the loss of her family’s treasured holiday home. 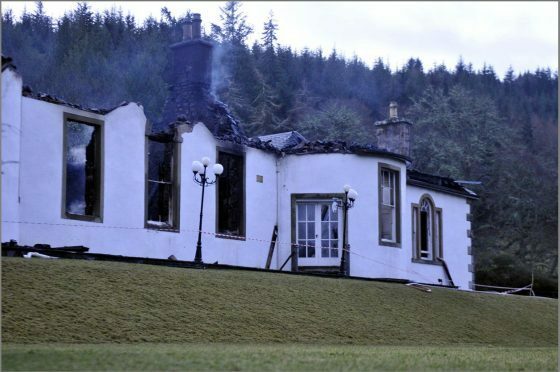 Boleskine House at Foyers was destroyed by a fierce blaze earlier this week. The Dutch owner’s daughter and partner are understood to have gone shopping and returned to find it on fire. No one was injured, but little remains of the 18th century property, which was previously owned a notorious Satanist and later rock guitarist Jimmy Page. Firefighters were called from Foyers, Beauly and Inverness shortly after 1.30pm on Wednesday. A total of 23 crew used hose reel jets and breathing apparatus but were unable to save the property. Flames up to 20ft high shot from the roof and soon incinerated most of the building. Annette MacGillivray, who extensively renovated the property after buying it from Led Zeppelin star Mr Page before selling it to the Dutch family a few years ago, said: “The family went out at 10 o’clock to shop in Inverness. “When they got back the place was ablaze. I think it started in the kitchen. This is dreadful news. “When we bought it, it was a hovel, just a shell. We spent a lot of money, stripping it back to the bare walls and re-roofing it. “It had four bedrooms, four bathrooms, a huge drawing room, dining room, library and various smaller rooms. Asked if there had been any “strange” incidents while she was living there, Mrs MacGillivray said: “Not one. I am a non-believer and didn’t listen to all that rubbish. She said believed the current owner had been considering selling the property. Occultist Aleister Crowley, self-titled as “The Great Beast 666” and once branded “the wickedest man in the world” by a 1920s newspaper, bought Boleskine House in 1900 because it fitted the bill for his black magic practices. He died in 1947, aged 73, was a sexually liberated recreational drug-taker long before the 1960s social revolution and preached a “do what thou wilt” philosophy. Mr Page bought the house at the height of Led Zeppelin’s fame in 1970 as a restoration project and base for songwriting. Hotelier the late Ronald MacGillivray paid £250,000 for the house. It has since been used as a private residence and a guest house. It was put up for sale in 2009 for £176,000.